Even though we have had to go through a weekend with less football than we are used to, we have looked into the national team games from the past week and found some nice boot spots for you. As the clubs have had a break, the national teams have been in action, and we will zoom in on some of the boot spots we have found the most interesting. Victor Ayala (Paraguay)  Adidas Predator LZ SL Neon/Black/Red We always enjoy watching football from the national teams of South America, who are very good at finding some very interesting boots to wear. 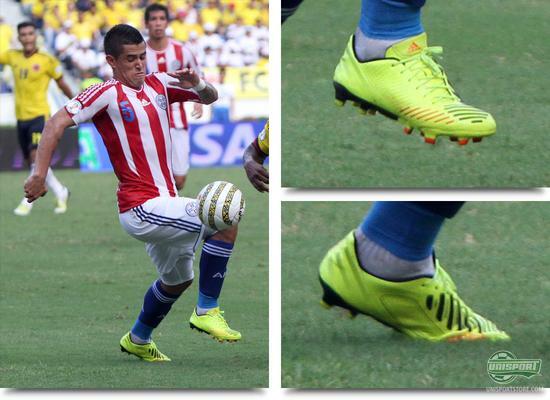 We spotted Victor Ayala from Paraguay in a pair of super light Adidas Predator LZ SL. 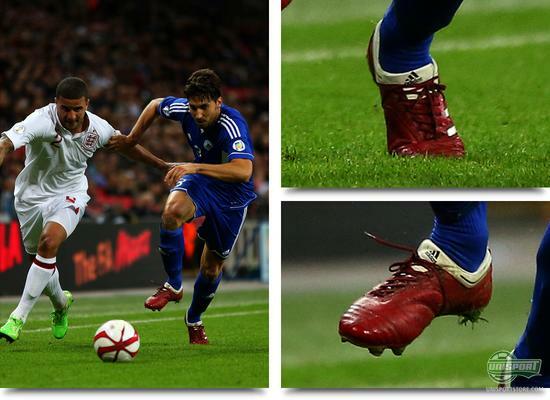 Last week we had a thorough look at this specific boot, as we looked into how it differs from the original Predator LZ. Radamel Falcao (Colombia)  Puma Evospeed 1 Orange/Green This guy is on fire! Ayala and Paraguay (just mentioned) suffered a defeat to Colombia, led by Radamel Falcao, who found the goal twice, hereby securing a win for his Colombian national team. 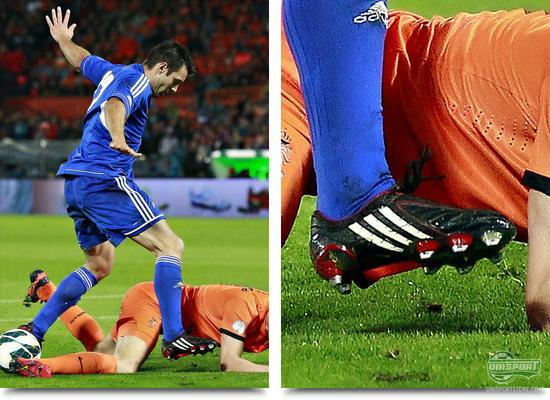 He did it wearing his beloved Puma Evospeed 1 in the new Orange/Green colourway. Do you think this could be the last season in Spain for the successful Atletico Madrid striker? Angel Reyna (Mexico)  Adidas Adipure IV SL White/Gold/Black Oh yes, our WebTV host, Jacob, almost jumped like Angel Reyna in this picture when he spotted this Adidas Adipure IV SL in action. This boot is an absolute favourite with Jacob and he always applauds any player who wears it. It seems like Reyna is just as excited about the boots, as Jacob, or maybe he is just celebrating the goal he scored against Guyana. I think it is the boots. Alejandro Saúl Chumacero Bracamonte (Bolivia)  Adidas F50.7 Tunit Red/White We are really liking this player's name, and he easily makes it into our boot spots with a boot choice like this. The midfielder, with a height of just 1,57 meter, scored the equaliser against Peru, wearing a true classic  the Adidas F50.7 Tunit, a boot we haven't seen in action for quite a while. Do you remember the boot that allowed you to you change everything from studs to outsole? Rafael Farfan (Peru)  Nike CTR360 Maestri Red/Black/White Here we are talking about a true 'modern classic' boot. Many will remember the launch of the first control focused football boot from Nike  the Nike CTR360 Maestri III. In addition to matching Farfan's kit like a dream, this was also an incredible football boot, which had Cesc Fabregas as its front figure. How do you remember this beautiful boot? Walter Gargano (Uruguay)  Adidas Predator LZ Blue/Red Blackout We are very much into blackouted boots, but we prefer if it has been done properly. We always applaud a properly blackouted boot, but with an attempt like Gargano is responsible for here, we have to hold back on the applauds. 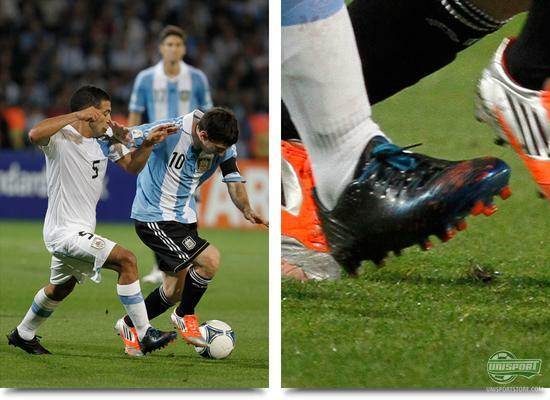 The victim in this case was the launch colourway of the Adidas Predator LZ, and Uruguay also suffered a defeat against Argentina and Messi who scored two goals. 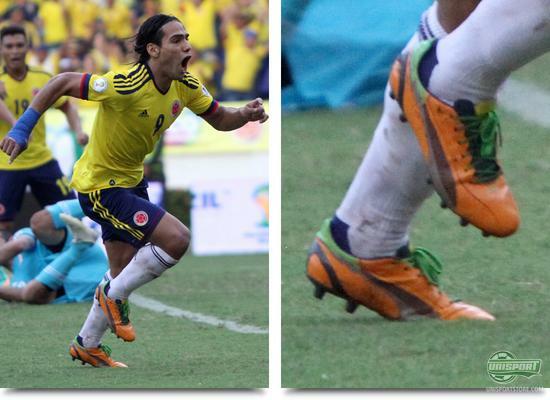 Alexander Dominguez (Ecuador)  Nike Mercurial Vapor VI Black/Orange/Silver We have been busy scanning the South American matches, as they are known to be very interesting and surprising. Our work is rewarded by a spot like this where we can see the Ecuadorian keeper wearing a pair of the most sought after Nike Mercurial Vapor VI's ever, the Black/Orange/Silver colourway. He was not the only keeper who was into this boot, as Danish keeper Anders Lindegaard began his Manchester United career in a pair of Nike Mercurial Vapor Superfly II in the same colourway. 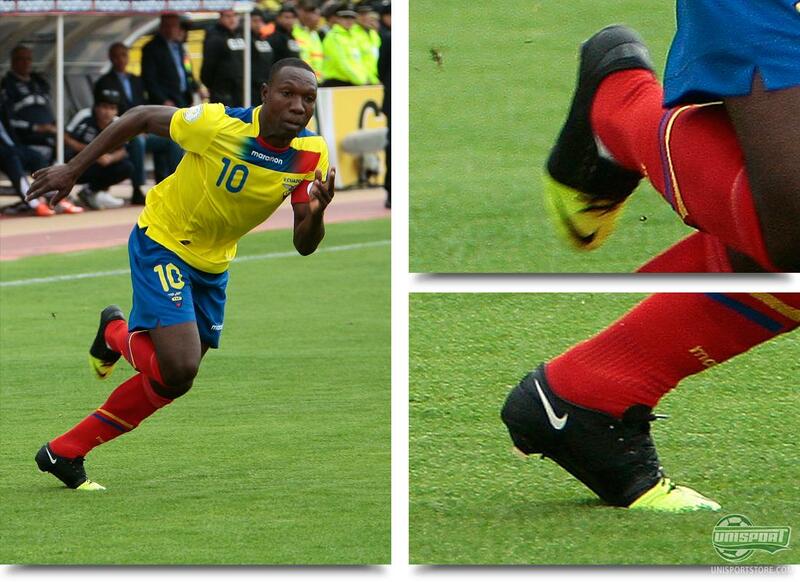 Walter Ayovi (Ecuador)  Nike Green Speed Neon/Black Walter Ayovi quickly demanded our attention as we saw the boots on his feet. 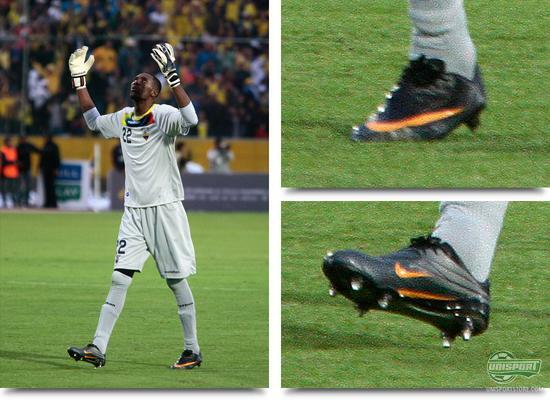 He was wearing nothing less than a pair of the highly limited Nike GS, that were only produced in 2012 pairs. Earlier, we have seen players like James McClean and Rafael Bastos wearing the Nike GS, and we are very glad to see that professional players have just as much passion for football boots as we have. Thumbs up! 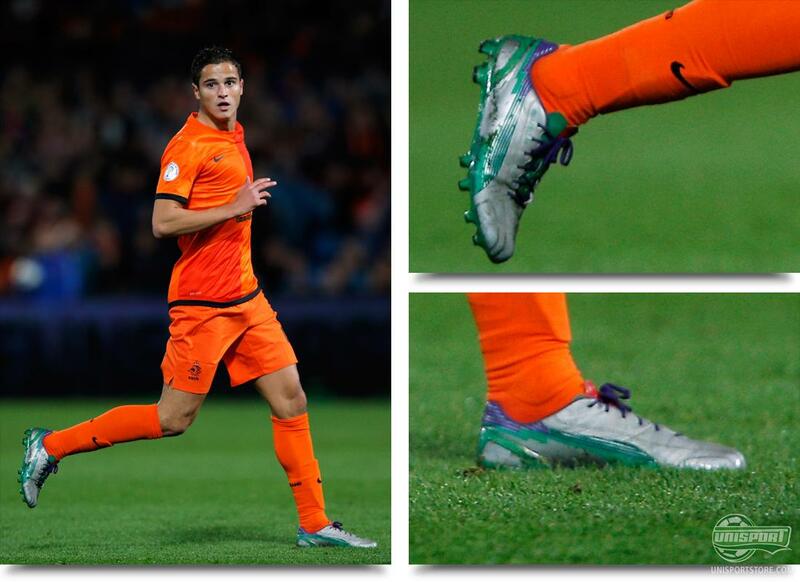 Ibrahim Afellay (The Netherlands)  Puma Evospeed 1 Silver/Green/Purple The super fast winger, who is on loan at Schalke 04 from Barcelona this season, used the national team game to début his new Puma Evospeed 1 Silver/Green/Purple. 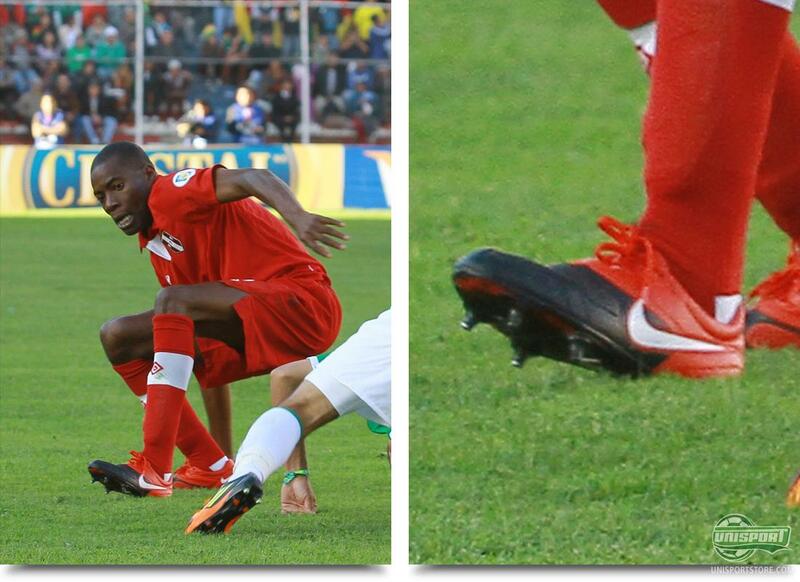 Previously, we had only seen this boot on the newly signed Puma player, Gael Clichy. A very eye catching colourway for sure; what do you think of it? Victor Hugo Moreira Teixeira (Andorra)  Adidas Predator Powerswerve Black/White/Red Another very cool name from last weeks games comes from Andorra, who otherwise, suffered a defeat against the orange football superpower. The Netherlands gave the national team of Andorra a beating, and showed impressive football skill in a match that ended 3-0. Despite the tough match, Teixeira still manages to nicely flash his classic Adidas Predator Powerswerve; a boot that we have a very special relationship with here at the office, and I mean that in a good way. Mirko Palazzi (San Marino)  Adidas Adipure II Red/White Although the nation of San Marino has a population of 29.000, they are still determined to go to the Euro and world cups. Their 'amateur' national team are on a mission. No offence, but the player right here is the only professional player in the squad, and he plays in the 4th best league in Italy. Now on to the boots. Palazzi displayed true style in his Adidas Adipure II Red/White  a super nice kangaroo leather boot, that a few of the colleagues here at Unisport miss very much. Fabio Vitaioli (San Marino) Adidas F50 Adizero Chameleon/Purple Another great boot spot from the small nation could be seen on the feet of this gentleman, who was wearing the very first version of the Adidas F50 Adizero, in the very wild colourway, that can be rather difficult to name. We're gonna go with Chameleon/Purple, as it, somehow, manages to blend in with its surroundings. Danny Welbeck (England)  Adidas F50 Adizero Silver/Orange The talented attacker found the net twice as England sent San Marino back home with a 5-0 beating. He scored the goals wearing a pair of Adidas F50 Adizero Silver/Orange, which we also spotted him wearing the week before for Manchester United. It, therefore, looks like Welbeck has completed his boot change from his Nike T90 Laser IV and onto the German sports giants at Adidas. His new Adidas boots have surely gotten a good start, so he might as well hang on to them. 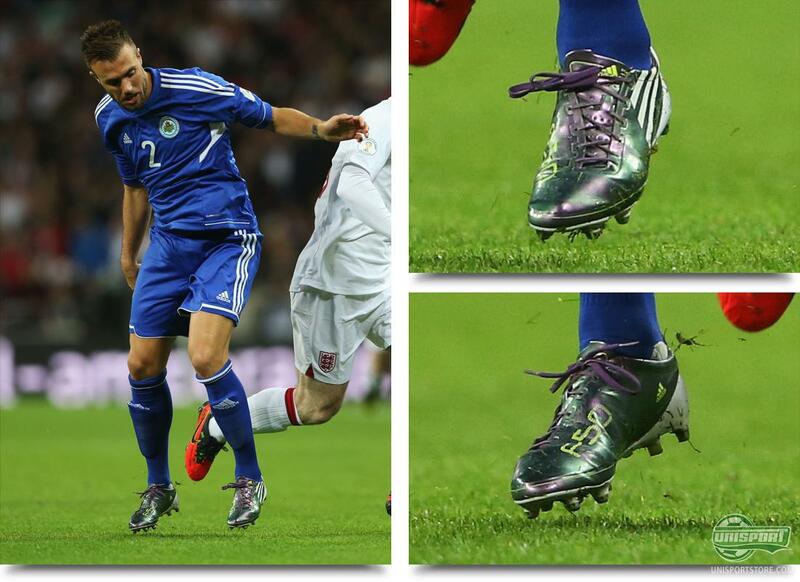 Tom Cleverly (England)  Nike CTR360 Maestri III White/Volt/Court Green ACC While his team mate, Welbeck, is switching from Nike to Adidas, Tom Cleverly is doing it the other way around. Although he produced a wonder strike in his Adidas Predator LZ last week, the young midfielder has completed a switch to American Nike and their CTR360 Maestri III White/Volt/Court Green ACC. Wearing these boots, he played a very fine game where he also produced a few assists, so our guess is, that Nike are pretty happy with their new signing. Mesut Özil (Germany)  Adidas F50 Adizero Whiteout This guy seems to be in a lot of doubt. It looks like he has a lot of trouble figuring out which boots suit him the best. The German midfielder has been flirting with a pair of Adidas Predator LZ, as well as, these Adidas F50 Adizero, and none of them seem to have gained his accept yet. 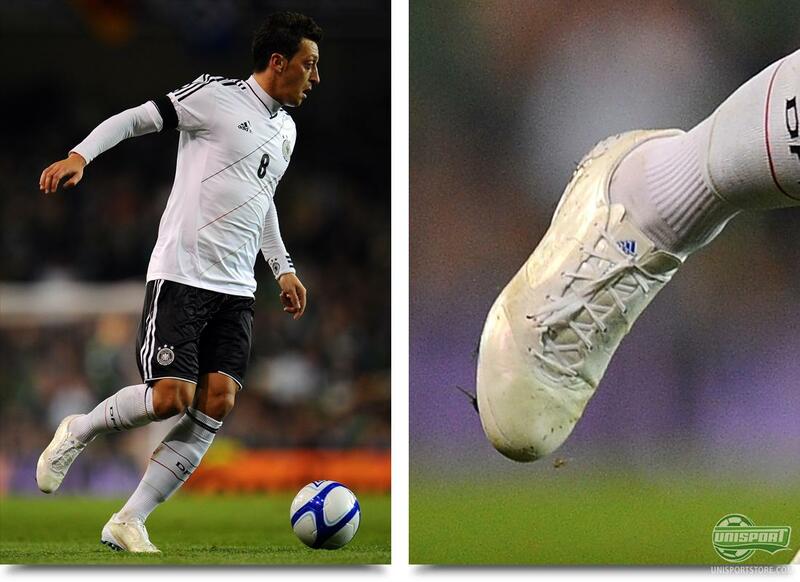 Which boots do you think Özil will end up deciding for? 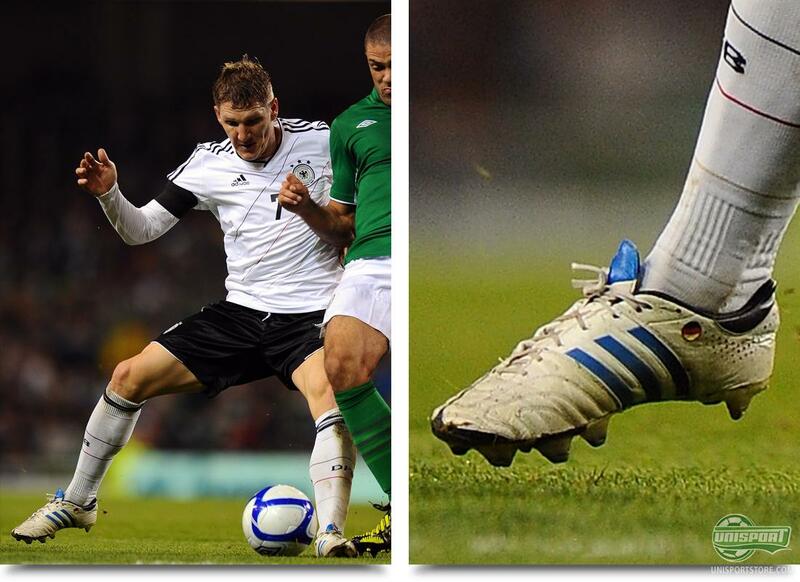 Bastian Schweinsteiger (Germany)  Adidas Adipure III Custom White/Blue/Black On the same team we also find a player who, on the other hand, is very sure of which boots he prefers. 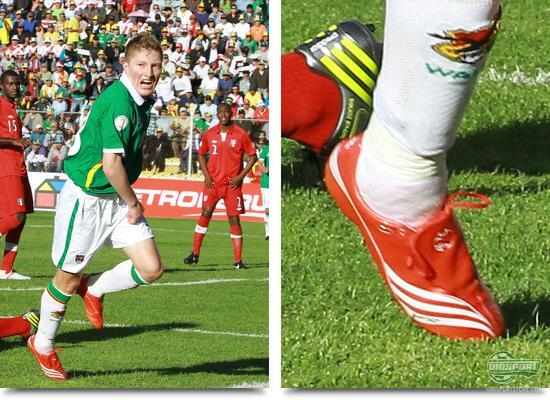 Since Adidas Adipure III first saw the light of day, back in 2010, Schweinsteiger has been wearing the super nice leather boot, and he has even managed to have Adidas design him a custom pair, which might look like the Adidas Adipure 11Pro for the untrained eye. We are looking forward to watch some more national team action this week. Personally, I will be watching Italy take on Denmark tonight. All of this of course means that we will be on the lookout for more national team boot spots. We would also like to hear what you think think of the past weeks boots spots? Which is your favourite? Feel free to leave a comment in the field just below.